We love Eating Clean here at BWLW, but we know that you may have to tweek your meals for your needs. One of the top areas that has to be addressed is the amount of carbs you’re eating. Carbs are the nutrient that many people get way too much of, compared to protein and fats. Most people will be properly fueled for workouts and day to day living with a daily diet that is 25-40% carbs (depending on a number of unique factors). 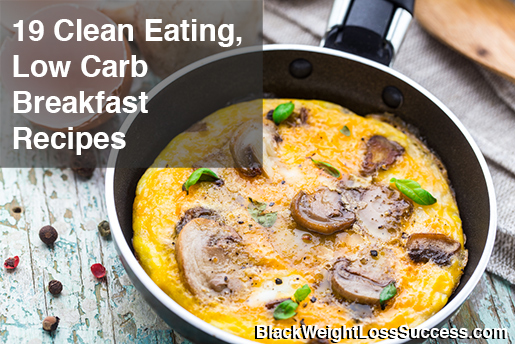 Here are 19 Clean Breakfast recipes that you can work into meal plan for some options that are lower in carbs. These savory muffins can be made pretty cheaply with a variety of ingredients. Left over protein or veggies from yesterday’s dinner or lunch are perfect for egg muffins. Make a batch and freeze the extras for later. This is one of my go-to morning smoothies. Full healthy carbs, protein and flavor! Looking for a low calorie, high protein smoothie that will help tame your sweet tooth? This one has 261 calories and 30.5 grams of protein. Savory and full of healthy ingredients, this frittata is low carb and clean. There’s a group called OA (overeaters anonymous). Please check it out. Thanks, the recipes are great.